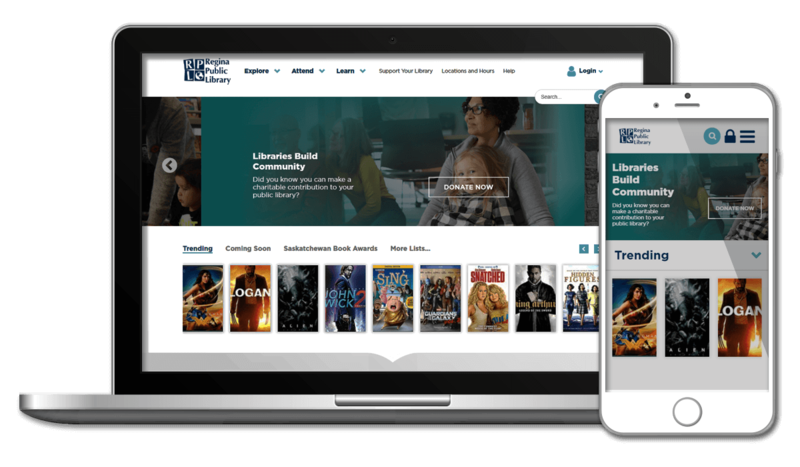 When the Regina Public Library wanted a next-generation website for their patrons, they enlisted the services of Engineered Code to implement their vision using Drupal. The Regina Public Library (RPL) was founded in 1908 and serves the citizens of the capital of the province of Saskatchewan. With more than 75,000 active card holders in 2016, they provide services ranging from the traditional book borrowing, to digital services access, a film theatre and an art gallery. RPL desired a refreshed design that used real images from their catalogue of available content to deliver a visually appealing website. It was critical that the site gave patrons quick and easy access to one of the most-used features, the catalogue search. It also needed to provide an authenticated experience for the patrons, including the ability to request books, place holds, and view their checked out items. Finally, an integration with a third-part events platform was required to ensure the most seamless registration experience possible for patrons. Due to their affiliation with the other libraries across the province via Saskatchewan Information Library Services (SILS), whose platform of choice is Drupal, it made the most sense to move forward on that platform. Engineered Code developed custom Drupal modules to give RPL the functionality necessary to manage a wide variety of content, including multiple library locations, frequency asked questions, and digital services. Custom modules were also developed to create the authenticated experience for patrons, which requires a direct integration with the back-end catalogue database. To accomplish their goal of leveraging their catalogue content into the design of the site, multiple variations of carousels were created that dynamically pulled catalogue content and presented its cover art to the user; the list of catalogue content was controlled through the Drupal administrator interface. Also, a synchronization service was developed to pull event information directly from an external, third-party platform so that upcoming event information could be integrated into the website. The updated site launched in the spring of 2017, giving users a highly interactive experience for engaging with the Regina Public Library.